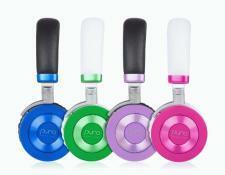 Puro Sound Labs has introduced a new volume-limited wireless headphone targeted at kids. Like other Puro Sound offerings, the JuniorJams over-the-ear headphones are volume-limited to 85 dB to help prevent noise-induced hearing loss. The headphones feature 40mm dynamic drivers, Bluetooth 4.2 with aptX technology, and a battery life rated at 22 hours. The protein leather ear cushions are collapsible and deliver 87 percent ambient noise isolation, and a high-sensitivity microphone is built in. The JuniorJams are available now for $79.99 retail. Puro Sound Labs has announced the expansion of their product collection to include the JuniorJams headphones for kids. The JuniorJams have been designed for performance, safety, durability, and comfort, with great value pricing. Puro Sound Labs is well known for delivering studio-grade audio quality headphones that utilize hearing-safe 85dB volume-limiting technology, which have won praise from reviewers and parents alike. The new JuniorJams feature an ultra-comfortable protein leather ear cushion delivering 87 percent ambient noise isolation, 85dB volume-limiting technology, and battery performance that offers 22 hours of playback. The JuniorJams also include a unique daisy-chain feature that allows two headphones to listen to the same source device simultaneously, so two kids or kids and parents can listen together. According to the World Health Organization, some 1.1 billion teenagers and young adults are at risk of hearing loss due to the unsafe use of personal audio devices. "Preventing noise-induced hearing loss while delivering best-in-class sound performance is our fundamental objective," says Brett Lacey, CEO of Puro Sound Labs. "We are thrilled about the JuniorJams launch, as it will further our ability to put more safe headphones on kids' ears around the world." The JuniorJams are available in four kid-friendly, creative, and inspiring colors, and are built with high-quality aluminum material that delivers a durable yet lightweight headphone for kids. They were designed to be extremely space efficient, folding into a sturdy carrying case for easy use while traveling. "In designing the JuniorJams we rolled up everything a parent would need and a child would want from a headphone," said Lacey. "Safety, durability, ease of use, cool style and awesome sound, these headphones will keep the front seat and the back seat happy." The Puro Sound Labs JuniorJams retail at $79.99, but are currently available for the holidays at $69.99 in blue, green, purple, and pink on Amazon.com and PuroSound.com. • Visit the Puro Sound Labs website for more product information. • Puro Sound Lab BT2200 Wireless On-Ear Headphones Reviewed at HomeTheaterReview.com.